Is There Enough Time For This? I was having a conversation with a good friend of mine about pursuing our dreams. He was explaining to me his life-long dreams and how incredible it was going to be when he achieved them. He had a very detailed description of all the items he wanted to attain and even HOW he would execute the plan. I’m telling you I was convinced this man was going to achieve success in no time at all. I truly believed in him. BUT…there was one problem…time. He described all the great goals he was looking forward to attaining, but would provide an equal excuse. His excuses went on to illustrate as to why it not only would be difficult to do, but nearly impossible because of not having ENOUGH time. It was like the conversation of dream building was cancelled out with the double talk of excuses. Not only was I confused by this duality, but I was frustrated! Here I had an ambitious friend emotionally attached to his life-long dreams that was sincerely convinced he wouldn’t see them come to pass because of time. Time is a HORRIBLE excuse…seriously. When broken down, you always have time; it’s a matter of what activities are hogging it up. Prioritizing your day by activities of importance, you will reveal that time was NEVER the issue…just an excuse! This TIME excuse was coming from a guy who played poker once a week, was in a billiards league, and played golf on the weekends. Come on man…you definitely have the time to achieve your goals; it’s a matter of how important their attainment is to you. MAKE THE TIME! 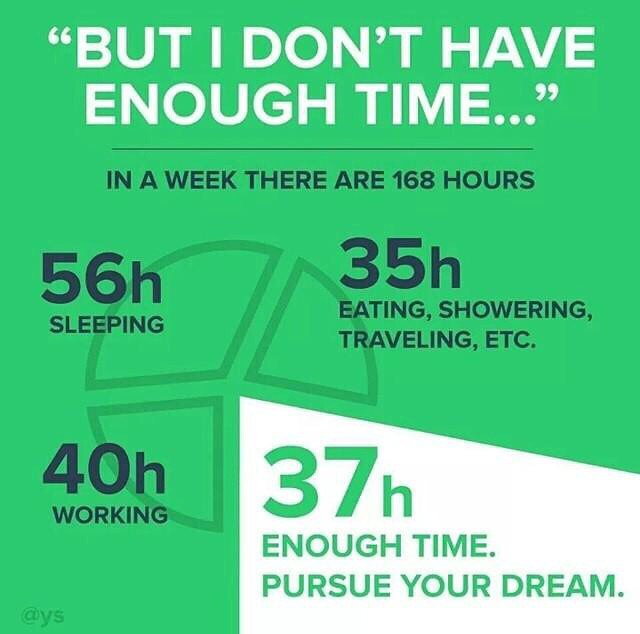 As seen in the image, there are 168 hours in a week. There is time for you to go after your dreams; it’s up to you to actually make time for them by cutting out the FAT! Don’t leave this world at 85 years old telling people there was never any time for you to pursue your dreams…the irony is just too much. Go out and prioritize your day/week/month and squeeze your dreams into the mix. Start small and scale it up!